‘Freedom of speech’ is a rhetoric we throw around in The West nowadays as if most people understand it and respect it. But as the image above shows, this is far from the case in many parts of the world – and even media in the West is somewhat restricted. 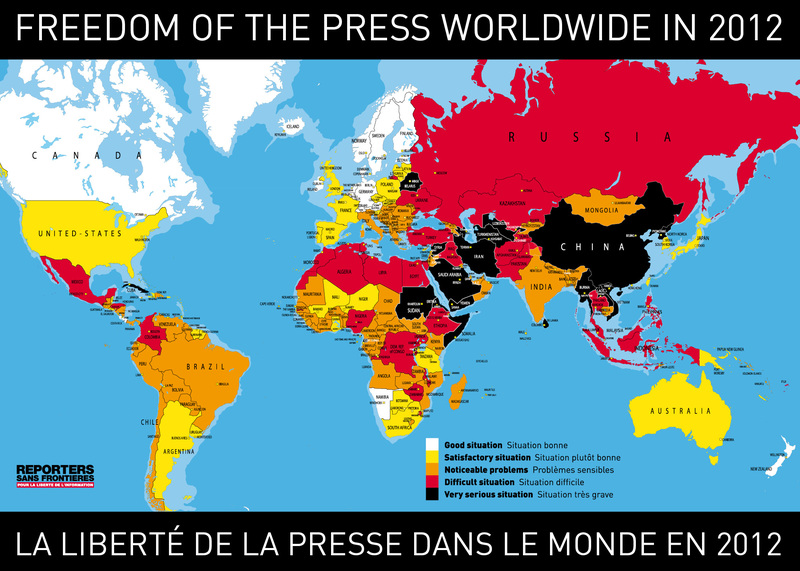 Today is World Press Freedom Day – an international attempt to highlight the restrictions, censorhip, or removal of knowledge that is available to the public, or permitted for publishing by the media. Here at Back2Stonewall we pride ourselves on our independent, unrestricted ability to disseminate truths, share information and to throw in a little opinion when we feel like it (OK, sometimes it’s a lot of opinion but we respect you readers enough to make up your own mind, to add your comments and to engage in intellectual debate). In many countries sites like ours is a far-off dream. As readers of this website, I assume you recognise the need and importance for freedom of speech and freedom of the media. Sadly, Reporters Without Borders reports that there have been 22 journalists killed already in 2012 and a further 161 imprisoned. With tragic irony, one journalist was killed in Somalia just yesterday. Unfortunately some countries are proving that internet freedom is not completely unstoppable, but hopefully they will acknowledge and accept Browne’s logic and effectively mobilise their citizens rather than restrict them.